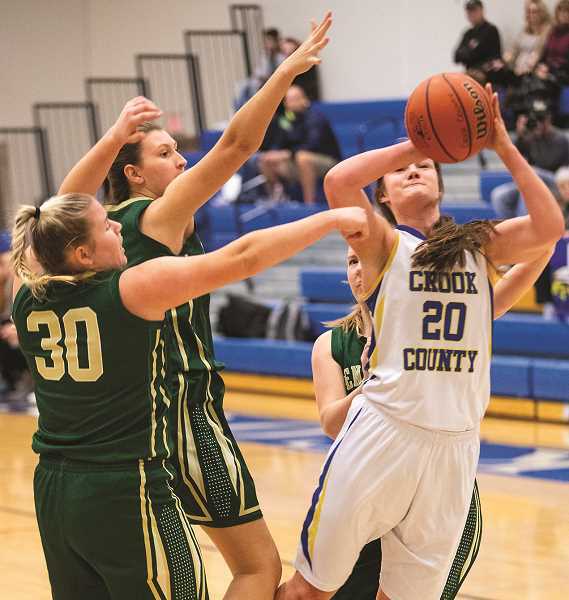 The Pendleton Buckaroos hit two quick three pointers, jumping out to a 6-0 lead over Crook County early in Friday night's league contest and never trailed as they cruised to an easy 77-30 road victory over the Cowgirls. "I think there are things we are doing well," Crook County head coach Heidi Lea said. "I think that we are a better team defensively than we showed tonight. That's something that we have to work on, because we are scoring more points this year, but we aren't finishing on the defensive end and shutting people down. We can't allow people to score 60 or 70 points." After the slow start, the Cowgirls played better for a short stretch, closing to within three points at 8-5 on a McKinzee Mode layup midway through the quarter. However, Pendleton put on another surge and led 19-8 at the end of the first period. The Buckaroo full court press hurt the Cowgirls in the second quarter. Although Crook County was able to initially break the press, they rushed their offense, leading to turnovers that resulted in easy Pendleton baskets. As a result, the Buckaroos outscored the Cowgirls 20-4 in the period, as they took a 39-12 lead into the locker room at the half. Crook County played better in the third quarter, scoring 14 points, compared to 19 for the Buckaroos. Still, Pendleton's lead increased to 22 points as they led 58-26 heading into the fourth. 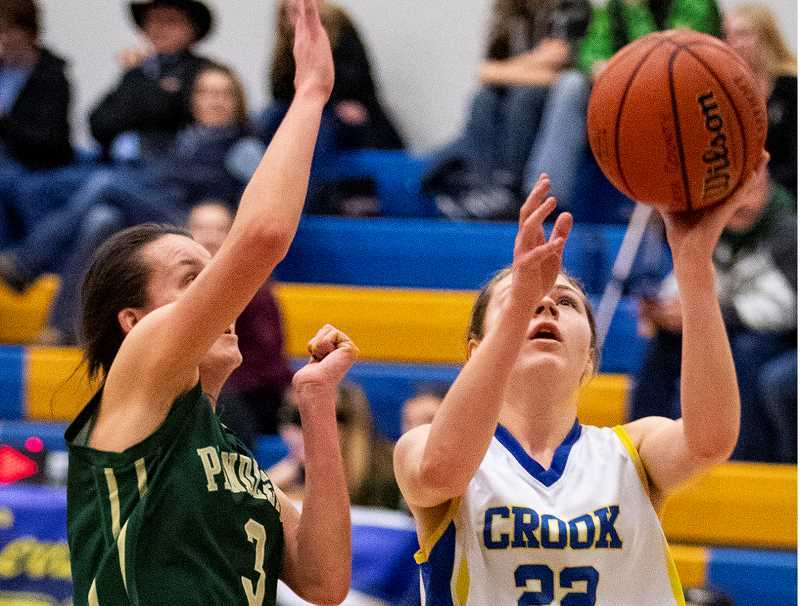 Crook County post player Liz Barker, who led the team in scoring on the night with seven, got into foul trouble and went to the bench part way through the quarter. From that point on, the Cowgirls struggled to score as Pendleton continued to pull away. "Sometimes we over-focus on one thing," Lea said. "We told our kids tonight we have to really focus on bringing up the third quarter, and then we come out and forget to play the other three quarters." The fourth quarter was more of the same as the Buckaroos outscored Crook County 18-4 as they ran away with the easy win. Teagan Freeman added six points for the Cowgirls on a pair of second-half three pointers, while Josie Kasberger, Heather Ptomey and Mode all finished with four points. Pendleton was led by Muriel Hoisington with 16 points, while Nicole Lee and Merysha Garcia each finished with nine. Pendleton did much of their damage from long range, knocking down 11 three pointers on the night. The Buckaroos hit on 41 percent of their shots from the floor, while the Cowgirls shot just 22 percent from the field. In addition to her seven points, Barker also pulled down a game-high 12 rebounds. "I thought Liz played a good game," Lea said. "She did a great job, she just got in foul trouble." With the loss, the Cowgirls fell to 0-2 in Intermountain Conference play and 1-13 overall. Meanwhile, Pendleton improved to 2-0 in conference play and 5-10 overall. The Cowgirls are off until Friday when they host the Ridgeview Ravens (1-1, 6-10) in a 7 p.m. game. Pendleton – Muriel Hoisington 16, Lee 9, Garcia 9, Nirschl 8, Scott 8, Blake 6, Spriet 5, Neveau 5, Jenness 4, Bradt 4, Taber 3, Cooley. Totals: 28 10-19 77. Crook County – Liz Barker 7, Freeman 6, Kasberger 4, Ptomey 4, Mode 4, Hutchins 2, Rash 2, Brooks 1, McClellan, Ramoss, Papke. Totals: 12 4-16 30. Three-point goals – Pendleton Hoisington 4, Nirschl 2, Lee 2, Spriet, Garcia, Taber. Crook County: Freeman 2.